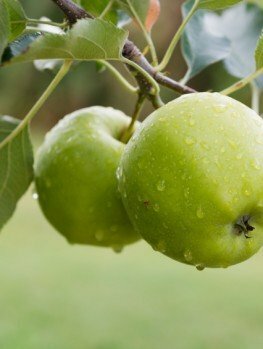 The McIntosh Apple Tree is an extremely popular apple variety and planting your own tree so that you can enjoy tree-ripened fruit is a great decision to make. Even in the coldest parts of the country you can enjoy this heirloom apple with its red-flushed skin and crunchy pure-white flesh. It is a great apple for eating fresh and also for cooking so nothing will be wasted and you will be enjoying apple treats from fall into the New Year, since the fruit stores well. 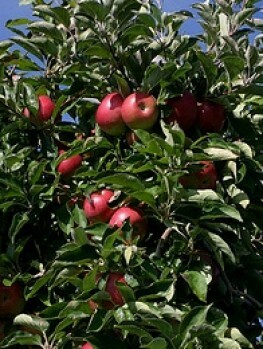 The tree is very cold hardy and resistant to many diseases of apple trees. It will grow in most soils and just needs a sunny location to thrive and give you bumper crops for years and years. 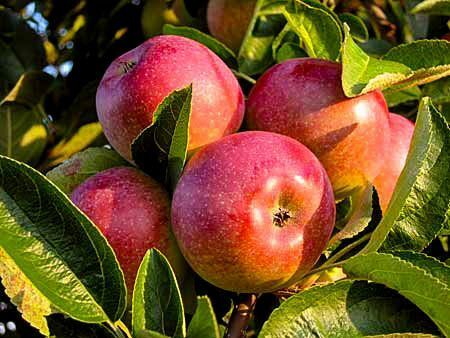 Nothing beats having your own fruit right from the garden and the McIntosh Apple is a great ‘first tree’ for anyone wanting to enjoy growing fruit trees right in your own garden. 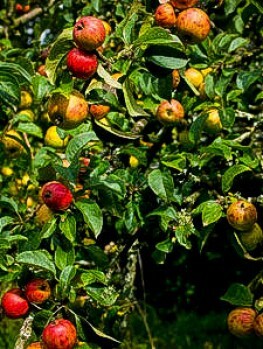 An apple tree is often the first fruit tree you choose to plant in your garden. Apples are easy to grow, produce a large crop and because they can be stored there is very little waste even from a huge harvest. As well, everyone loves apples and they are so versatile. They can be eaten fresh from the hand or in salads, baked into pies, turned into sauces or used in both sweet and savory dishes. You probably already buy lots of apples and if you could have your own tree the savings can be significant. Apples are especially useful if you live in colder parts of the country, since they are the hardiest of all the fruit trees. The McIntosh is an ideal choice for colder regions as it is hardy into zone 4, so it will grow in the coldest parts of the country. 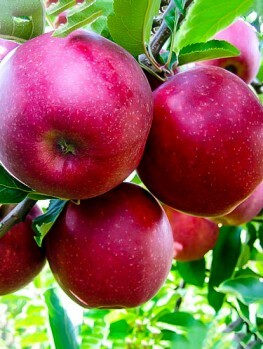 It actually grows better in colder regions and the fruit will be especially crisp and crunchy. 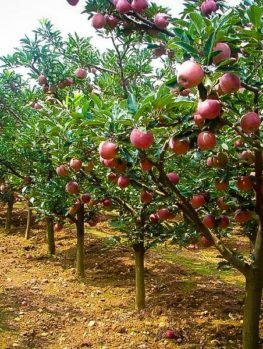 The McIntosh Apple Tree is not only cold hardy, it is also resistant to many of the major diseases of apple trees and is easy to grow. Any sunny position in most kinds of soil will suit it well and in a few years you will be harvesting bushels of your very own apples. The tree grows to about 15 feet in height and around 10 feet across. 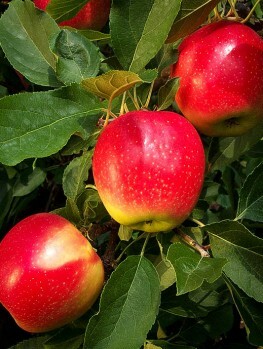 The McIntosh Apple Tree needs a second variety of apple for pollination and the Jonathan Apple Tree is an ideal choice. It will grow in similar conditions and both trees will benefit from the partnership by giving bumper harvests. You gain by having more choices and the Jonathan Apple Tree is a first-rate and popular apple. In spring the bare branches are covered with pretty white blossoms and these soon develop into baby apples. By fall your crop will be ready and those baby apples will now be full-sized, with crunchy, pure-white flesh that is sweet and yet acidic too, making it a very refreshing apple to eat fresh. The skin is green with red flushes and sometimes even the flesh can have red tinges close to the skin. 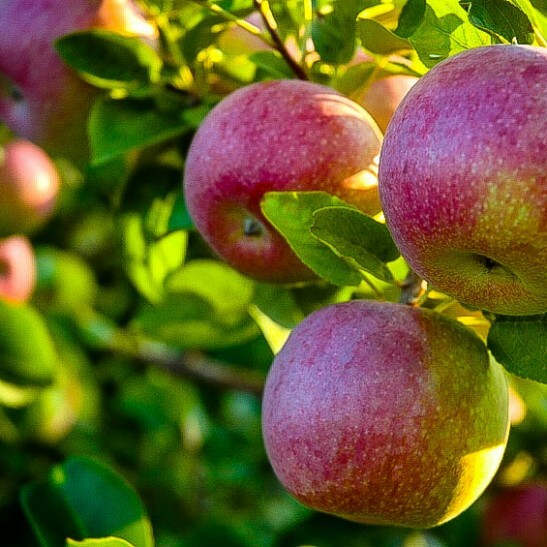 In cooler areas your crop will be ready to harvest a little before the end of September and by mid-October you should finish picking the apples as they will begin to soften if left on the tree. Your McIntosh Apples will store for up to 3 months if you keep it in a cool place just below 400F. Put the fruit into Styrofoam boxes or other suitable containers that will retain humidity with some air circulation too. Handle them carefully so that they don’t bruise when you are packing them for storage. 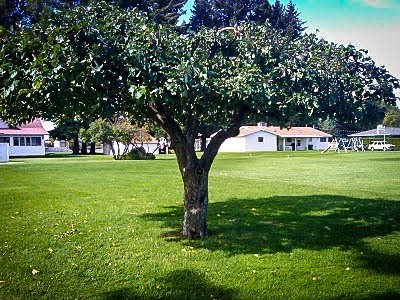 Choose a sunny location to plant your McIntosh Apple Tree. It will grow in most kinds of soil but will grow best in soil that is well-drained with some organic material in it. If your soil is heavy and holds a lot of water, dig plenty of garden compost, manure or rotted leaves into it to improve the drainage. Allow enough room for your tree to develop its full size, so do not plant too close to a building. Dig a hole that is three times the width of the pot and plant your tree to the same depth it was in the pot. Make sure the little ‘kink’ in the stem where the tree was attached to its roots is placed a couple of inches above the soil level. Put back most of the soil and fill the hole with water. When the water has drained away replace the rest of the soil. Add rich organic mulch over the root-zone and if this is replaced with fresh material each spring your tree will probably not need any other fertilizer. If you see a lot of baby apples developing, thin them out when they are small. To do this, remove all but one fruit from each cluster, just leaving the largest and best one to develop. Remove more if necessary so that you have about one fruit every 5 inches along the branches. This way you will get good-sized fruit and even more importantly you will get a good crop every year, since the McIntosh apple tends to produce a very large crop one year and a small one the next if the fruit is not thinned in this fashion. The McIntosh Apple is an heirloom apple tree that originated from a seedling on a farm in Canada belonging to John McIntosh. He discovered the tree in 1811 and by 1835 he was selling fruit from the orchard he had developed from his tree. 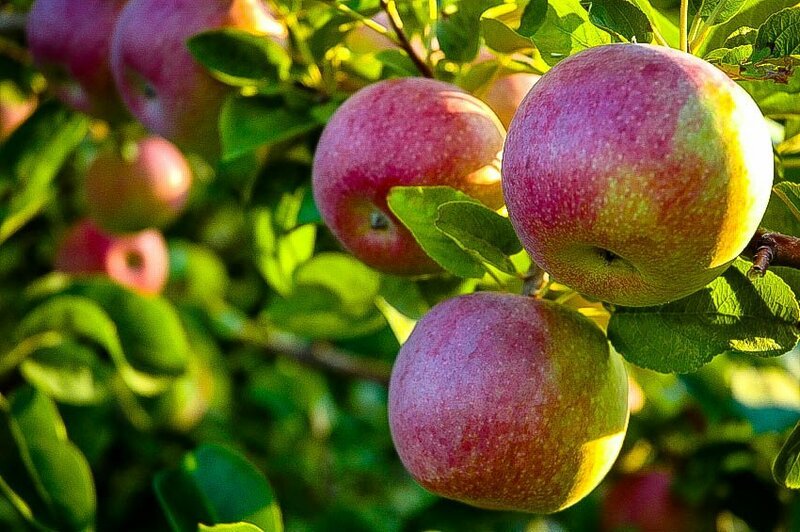 By 1900 it was perhaps the most common apple in Northeast America and continues today to be one of the most popular apples in North America, known especially for its dual purpose use for eating fresh and for cooking. 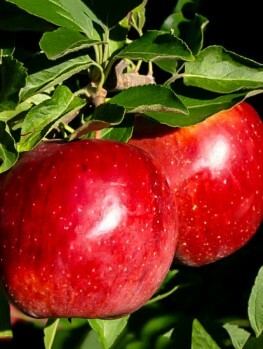 The McIntosh Apple Tree is a special, heirloom variety that must be produced the correct way. 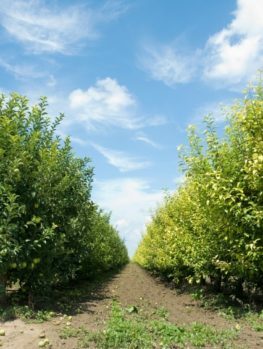 Our trees are grown from stems of the exact variety grafted onto special roots that keep the tree smaller and healthier too. Beware of cheaper seedling trees that will not be the correct variety and will only grow to be a big disappointment to you. Our heirloom McIntosh Apple Trees are true to the correct variety and we will supply you the best plant for your purpose. However we are constantly renewing our stock so our customers get fresh, healthy plants, so supplies of this very popular tree may be limited. To avoid disappointment order now.